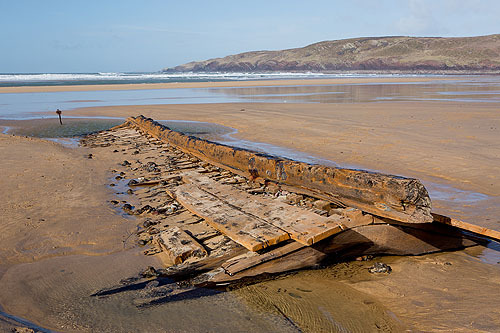 The Storms of 2014 lowered the sand levels and exposed this wreck in the middle of Freshwater West Beach. The 'WILLEMOES' was wrecked on December 25th 1924 , a wooden 3 masted schooner built in 1911 , on passage from Caernarfon to Erquy (Britany). A number of other boats have wrecked in this area ( Express , Astonomer , Blessing , Mary Ann , Thomas M Reed , Cherokee.... .) .